Contemporary, online introductions, like how I met Antonius Bui, still send me down a rabbit-hole of "(blank) in the age of the internet". I was tagged in a comment, on one of their Instagram posts, by a mutual friend we had met at respective residencies. The connection being that we were both based in Oklahoma at the time. At the time of this interview, Bui was one of the 2017 Tulsa Artist Fellows. This tag led to a binge-stalking of their Instagram feed. Then their website. Finally reaching out via DM and text. Lucky for me, they were heading down to OKC for a visit to a friend, and were available for a meet-up over drinks. We met in the Plaza District, exchanged pronouns and rapid fire of common friends, experiences, projects and complications of living in Oklahoma as POC. A few weeks later we met up for an interview at their studio in Tulsa. Antonius and DADA (their newly rescued dog) walked me over to the TAF studio building, where we began the interview. Major/Minor is the collaborative blog Bui runs with their brother, Joseph. The space is one that presents interviews and profiles on queer and trans people of colour, as a means of visibility and self-presentation. We always wanted to start a project together, and we're finally getting to a point where we are learning to collaborate more effectively. Growing up in a family of four kids, both of us growing up queer and artsy, and feeling Othered in our strict, Catholic, Vietnamese family - we just wanted a way to build community wherever we went. Being transient a lot of the time, they want to create a central space for others to gravitate towards - one that features the stories of exclusively queer, people of colour. The blog posts feature photo portraits, and Antonius and Joseph (graphic designer) are focusing on new ways of visually conveying each interview. I think a lot of people won't read through the whole interview, and I don't blame them, they take what they need. The dream would be to create a multi-disciplinary platform, with podcasts, a zine, the blog itself and we need to hop onto social media. Major/Minor is a lifelong work in progress that can use all the help it can get. We would love to have people from all over the world send us content based out of their local communities. All you need is a notepad, camera, and recording device. Let’s decolonize our minds and rewrite history together. The process of finding people to interview for Major/Minor relies heavily on personal introductions through friends they've met from the various residency stints across the country. Bui also isn't intimidated to use social media as a means of connecting directly. I'll literally DM someone and be like, "Hey, I think you're awesome! Let's meet up!" And since the LGBTQ community is pretty small, I think we're all yearning for a community. One of the more obvious and important repercussions of this project is that the digital platform, not only creates an accessible record of POC queerness, but also makes a diverse range of historical narratives available. We grew up in the Bronx, and my parents did production work, so imagine scarves, ties, accessories... I grew up packed in materials at night with my parents, using the heat sealer, staple gun, putting tags on stuff. I've always been interested in fashion, but having many friends and relatives who've done it, and growing up doing textile work for my parents made me aware of how much exploitation can be on the other end of it, I didn't exactly want to enter the fashion world. 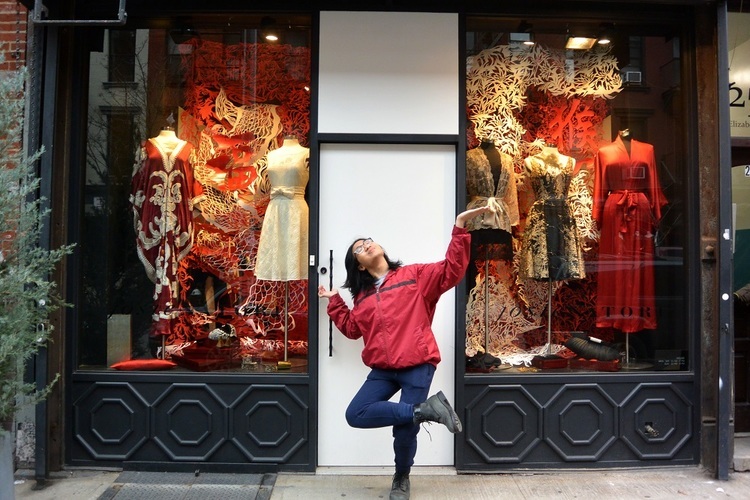 During my second year at the Maryland Institute College of Art (MICA) I was approached by Josie Natori, who is a Filipino-American designer, to do a window display for her storefront in New York, for New York Fashion Week (2015). This is a collaboration that is ongoing – Bui has recently finished a 4th installation for Natori. One fantastic thing about MICA is that we have an annual benefit fashion show where you don't have to be a fashion or fiber major to showcase your line. 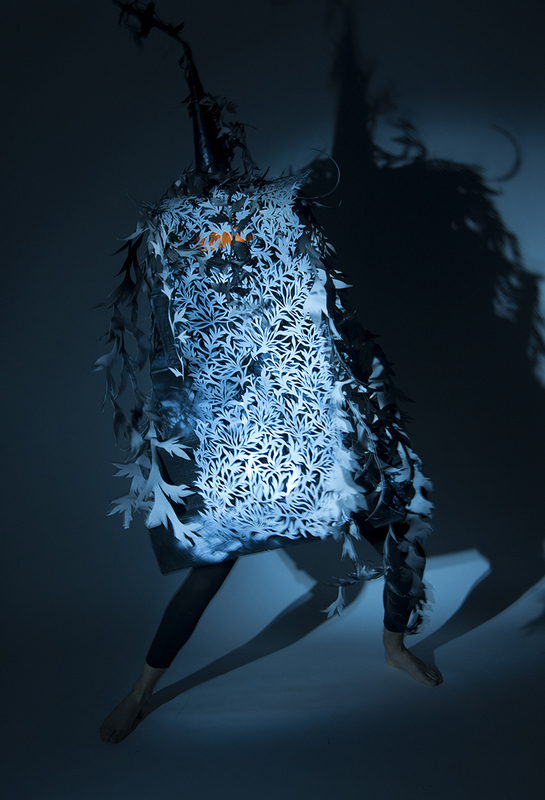 This produces a interdisciplinary show that pushes the boundaries of fashion. It was an opportunity for me to collaborate with my great friend Robert Penn - it was an extremely performative show. Bui and Penn’s collaboration for the MICA benefit fashion show was named Real Fun, (an anagram of funeral). 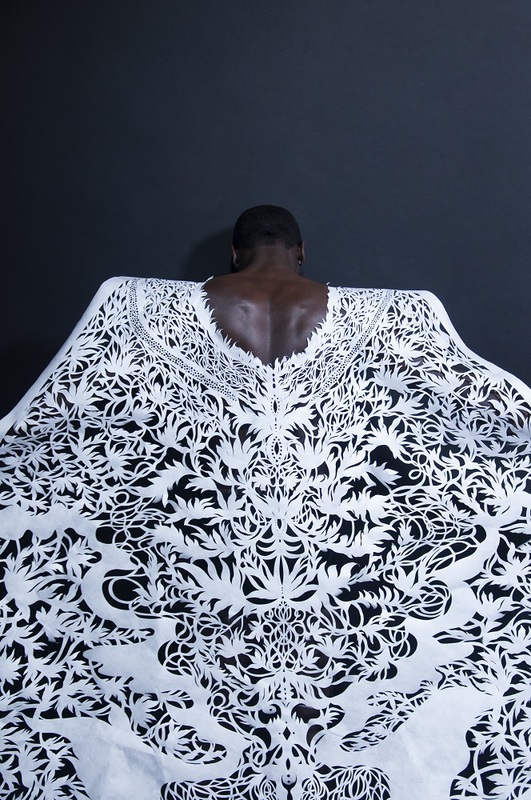 Themes of death, rituals and spirituality were presented using cut paper techniques for garments, complimented by more theatrical costume elements such as tombstones and monsters. Watching the video of that performance, the lighting is an essential role in highlighting the context of these garments - the overall form and especially the “negative space” of the cuts are distinguished clearly from one another. The effect is something akin to a foliage or floral flourish on the models. We came up with the idea of a military style formation, but then juxtaposed with the feminine, floral paperwork. We also created tombstones and monsters - it's kind of hard to imagine, but it draws parallels in my mind - how it's all over the place, and I can't imagine a show without a multi-disciplinary approach. The show definitely mirrored how I express gender and break away from heteronormativity. Bui's process of arriving at paper cutting was not straightforward. They began at the University of Houston, in a field unrelated to art production. I was studying chemistry at first, as a way to please my parents and their version of success. In order to transfer to MICA, they spent a semester creating an entire portfolio – predominantly of photo-realistic drawings. Every department I went to for a portfolio review was like, "You're a print maker! ", and I was like, "I don't know what printmaking is, but I'm going to apply with this major". I fell in love with relief printing, really enjoyed the production of screen printing, the multiplicity, the ease and then hand-cut paper work, I guess they developed side by side from there and it eventually just took over. The hand-cut part is important to my work, allowing me to reflect: whether it's the interviews with people, the moments I've had with loved ones, being in queer spaces - for me it's like rewriting history in many ways. The paper begins as a white canvas which I puncture, allowing the background and my narratives to shine through. The symbolism and meaning behind my use of cut paper has changed quite a bit. It first began as this interest in the history of paper, which started off in Asia and revolutionized the world in many regards. Then I was interested in dying - in the form of print. We're entering this technological age, and paper is a way to slow down. Now, for me, it's about rewriting history, writing queerness into that history - and POC queerness - since history is predominantly white. I'll say this cutting work is much, more intuitive. Whenever I'm back home and I'm forced to go to church with my parents, I realize how much of my upbringing is in my work - it looks like how the church is structured, it looks like stained glass windows, it looks like excessive flowers at the church and it also references the áo dài - the traditional Vietnamese garments. The cuts are so instinctive and ingrained in my brain, very cultural. While the newer body of work, the portraits, because I want to portray them as accurately as possible, they do start off as projected images that I then draw. They're more dictated, there's still space for interpretation - like the way I decide what's cut what's not, and what is perforated instead. The most striking piece in during our studio visit was, the portrait of Chris Lopez. I started exploring cyanotypes a lot because I was thinking more about the metaphor of light: shining light on a history that's often, not seen or heard. The dark blue background of the cyanotype cloth contrasts against the paler form of the head and upper torso of Lopez. The body is layered with ghostly traces of leaves and words that fade in and out of legibility. The cut paper portrait of Chris was shown at the Lawndale Art Centre in Houston. I used that piece as a stencil, and the middle region is a second cyanotype - I went over this stencil with a second exposure. The darker piece over his mouth was a happy experimental accident, but many people have enjoyed it - since this (middle region) is actually a poem he wrote called: My Brown Skin. The poems lines fade in and out of legibility creating a visual effect of waking up from a dream, ideas fading in and out of ones’ memory. The artist used Lopez's handwriting itself. It'd definitely one of the most rewarding parts of Major/Minor, where I interviewed him and was like, "Oh wait, Chris, I loved our conversation, I love our friendship, it would be an honor to portray you, may I photograph you?" He showed me this poem that he wrote, and I said, "Whoa Chris this is what we need!" I like the ins and outs of the poem in many ways, having to fight to read it, as well, because you need to develop a bond and relationship with someone in order to get to this point. Toward the end of the visit, we walked over to Living Arts, the gallery/project space where Bui had another portrait - one that had won Best in Show. The work is of another artist, educator interviewed by Bui for Major/Minor: Noèl Puèllo. Her portrait shimmers black and glittery as one moves past its space on the wall.The cut parts of Noèls’ clothing are simple strips that flop and fold themselves into facets that gently undulate at the slightest draft, or movement of a body around it. Her face is shaped and highlighted by intricate cuts that reveal the reflecting light from the wall underneath. Her features are bookended between her coiffed curls and beard, which flicker light caught on the dark glitter. Whenever I win an award, and it has to do with the project (Major/Minor), I give a percentage to the person portrayed and then a percentage to a non-profit of their choice. We’re giving 30% of the award to an art program that Noèl went to as a teenager, one she found her voice through. This practice is something Bui, set into motion after seeing other artists exposing their subjects and related issues in an exploitative manner. I'm still figuring out how to do it without feeling like I'm exploiting their story in any way. If you happen to have any suggestions, I am all ears. Though artists are often full of good intention, we sometimes enter communities, complete a project, and leave the people behind. I make sure to title it with a quote from the interview, and it feels a little didactic, but I feel we do need to slow down. We process images so fast through Instagram, that to have people take even three seconds longer to read a title is a small, meaningful gesture. Bui manages to organically integrate their interviews into their visual-art, again, taking on a multi-disciplinary approach in all, creative endeavors. For them, wearing several different hats (writer, artist, designer, performer) is an urgent necessity, one that comes out of a need for career survival. We are often times judged by the skills we can provide. Taking that on and realizing that these are platforms for our voices to be heard is empowering in many ways, but I can definitely see the other side of it - it's restrictive. You want to concentrate on this aspect of my life, but have to do all the other parts in order to be recognized. On Bui's website, they have separated their practice into three sections: Cut Paper, Explorations, and Major/Minor. I have an issue with the way that I compartmentalize my work, I feel so much pressure to do that, by the art world. In order to secure funding, to get these fellowships, and to explore the other work, I need to continue this paper-cutting work. Not that I don't like them, but I do need to find a way to combine them more. Like combining drawing with the cut paper work, I'm still thinking of printing large format photos, and cutting into that. Now that we're talking, I realize how important fashion is and how it continues to influence me. It combines every aspect into one form: photography for the shoots/editorial, the writing, the textile design, the performance aspect of the shows itself. ReModel Minority and Model Minority Mutiny are two series of laser cut, monochromatic paper works featuring statements such as, “NOT YOUR MODEL MINORITY” and “NOT YOUR ASIAN SIDEKICK”. The work seeks to confront silenced issues of being a “Model Minority”. This came out of a sense of urgency - both bodies were created in less than a week. I needed to make these for myself. The term describes demographic as being perceived to be more successful socio-economically (ie. family stability, low-crime, highly educated and financially stable) than the general population. The controversy around this term comes from the lack of government intervention and adjustments inequalities in the group, because of the perceived success. This "model minority" thing is such a myth: there are so many Asian Americans and Pacific Islanders who are struggling. It not only affects AAPIs who don’t achieve/ don’t desire the “American Dream”, but also negatively impacts other minorities as well. For instance, my parents blame Black and Brown folks for their problems because they don’t understand systemic racism and their histories. The Model Minority Myth creates this unrealistic idea that hard work alone leads to success. Lies! With Model Minority, I will say, I am so annoyed with apolitical Asians. So many AAPIs can be so apathetic and I understand why: there’s huge history of separating us from Black people, and also riding on anti-blackness to get to that level. I hate, hate the idea of the Asian guy who is into cars, and sport, who prefers skinny, pale Asian women, who lifts – they aspire to white “bro” culture so much! They can be so complacent! Get politically involved and stand up for other marginalized groups. Too often you only see Asian Americans stand up when it comes to cinema and actresses and actors - and it's important! But, where are we at marches and protests? Where are we for Black Lives Matter? Where are we for DACA? This sense of solidarity is something Bui follows online via closed Facebook groups like Sad And Asian. They started out as a phenomenal femme Asian Art collective, Sad Asian Girls, based out of New York. The closed Facebook group relies on heavy moderation by the organizers – calling out users for inappropriate behavior and posts that do not follow the group rules. Some of the rules include tagging everything: Friday is "LGBTQA day", Thursday is "Disabilities day", and Saturdays and Sundays are "No East Asians day" - so they're very aware of how East Asians are often highlighted over other Asian groups. They provide reading groups, you can vent, advertise opportunities, even just, "Hey, I’m going through this - is anyone else going through something similar?" It's politically charged and to be part of this group, is like "YES!" Other groups that I have found include VANGUARD and the Tiger Balm Project, both fantastic zines that cater to Southeast Asians. Now it's a matter of trying to get other Asian friends involved! Yeah, a lot of the slogans (in Model Minority) were informed by conversations with community members or looking at problems other AAPIs go through, looking at AAPI resistance history as well - like reading about the term "Yellow Peril" and realizing, I wasn't taught any of this…it's crazy how much history was hidden from us!